If you use real cloth nappies then you need an antibacterial nappy cleanser that is kind to you and your baby. 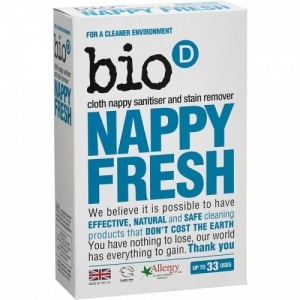 Bio D Nappy Fresh is a unique, antibacterial, germicidal sanitizing powder for the safe, effective cleansing of re-usable textile nappies at low, energy-efficient temperatures. Ideal for soaking your nappies and it also makes an excellent wash booster to help keep your white's white. 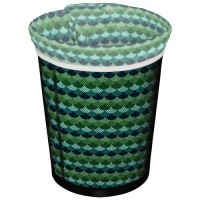 An environmentally friendly alternative to chemical nappy soaks. Available in 500g recyclable boxes. Eliminates odours. Happy with the purchase. Very good for keeping nappies clean. Great for cleaning soiled baby grows from a breast fed baby. Wash out with washing up liquid and soak over night. This stuff is brilliant and for the price it’s so worth it!! Makes washing nappies so much better!! We've been using Bio D Nappy Fresh with our cloth nappies for nearly 3 years and have never had to do a strip wash. No loss of absorbancy, no damaged nappies, no smells, just clean nappies ready to go back on the bum. Great product, and a box lasts ages as only a small amount is needed.